Casa Thu is a beautiful new home located in Pacific Heights, where the ocean, mountain and valley views are absolutely some of the prettiest in Costa Rica. Some people say they are some of the prettiest in the world! The mountains around are filled with all types of wildlife including birds, parrots, iguanas, deer, racoon family animals and lots of monkeys. The community of Potrero is located at the bottom of the mountain, just a short 5 minute drive down. There are several restaurants, grocery stores and beaches in Potrero. One of the best off the road beaches, Playa Penca, is a beautiful secluded beach with views of the Catalina Islands. Flamingo is a 10 minute drive, where you can find more restaurants, bars, casinos and the white sand Flamingo beach. The CPI spanish school is also located in Flamingo. The owners of Casa Thu has furnished the home beautiful with tropical style in mind. The home is fully furnished with all the amenities of home. Area Activities: Some of the favorite local activities include: horseback riding, diving, snorkeling, sailboating, catamaran trips, sport fishing, canopy tours, eco tours, atv tours, surfing, beachcombing, and just laying by the pool. Happy Snapper, Marie's, Mar y sol, Belgium restaurant, El Castillo, Maxwells, Il Forno, Gringo Jack's, Marco Polo, Las Brisas, Sugar Beach, Sol y Mar and several others. Most restaurants have bars and Mar y Sol is know for its upstairs tapas bar with beautiful ocean views. Beaches: Local beaches include: Flamingo Beach, Conchal Beach, Playa Potrero, Playa Penca, Playa Prieta, and Sugar Beach. Each beach has its own unique feature and worth a visit! Towels and paper items provided. Upstairs half bath. Outside pool half bath. Casa Thu is fully furnished and has maid/pool service provided. The house has a security system and is fully gated and private. Say Yes to Casa Thu! The pictures CANNOT do this place justice! Seriously, the view from this house will knock you off your feet. This was our second time to the Playa Flamingo area within one year. The first time we came with friends and stayed at a different home that we booked through Special Places of Guanacaste. This time we brought our kids (ages 7 and 10) and Special Places helped us reserve this house even though it is technically managed by Tropical Homes of Costa Rica. I have always had excellent service working with Special Places, and as usual they were waiting for us to arrive and showed us the home. If you rent this home and also rent a car you cannot get to this home unless you have an SUV. Don't even attempt it. The road up to the house is insane. It is deeply rutted, rocky, and at an almost comical incline. If you are afraid of heights this might not be the home for you, but wow, the view is is just gorgeous. We were greeted by Danilo and Magda, husband and wife caretaker and housekeeper. Danilo is outside every morning and afternoon watering the flowers and plants. I felt a little uncomfortable at first with the idea of our children sleeping downstairs away from us, but when you see the home and the security measures they have in place it's easy to let those fears go. This home is super private and secure. The wifi worked great, too. We heard howler monkeys almost every single day, and seen monkeys one morning. We seen Coati (Pizote) on a couple different occasions, and lots of lizards. There were a lot of interesting insects including a funny encounter with a praying mantis. The home was incredibly clean. Magda always managed to slip in and clean when we weren't there, and even washed and changed our linens halfway through the trip while also washing and switching out our towels. Oh, and at nighttime if you listen, you can hear the waves crashing on the ocean. Overall, I would highly recommend this home. It is beautiful! The property was excellent, beautiful view, very clean, very well furnished and stocked, etc. The issue was the property manager's staff. The individual that took us to the home when we arrived gave me his cell number to call for any issues. Then his number was the one listed in the info book in the home for emergency issues. We had several problems while we were there, the 2 biggest issues being the entry gate remote gave us all kinds of trouble and one of the a/c units quit working. I called that number numerous times and he would never answer. I finally left a voice mail and still no return call or anyone that was responsive to the issues. Totally unacceptable for any rental but certainly one that I paid several thousand dollars for. This was the second time we rented from Tropical Homes, the first time was March, 2016 and we had great service. We come to Costa Rica often and the service on Casa Thu was so bad that I will shop around on my next trip and not come back to Tropical Homes automatically like I did this time. I'm sure some of the problem was because it was a holiday weekend (New Years) but when paying the kind of prices we were paying everything should be working and if it isn't it should be repaired immediately. THE PERSON ON CALL NEEDS TO TAKE PHONE CALLS NO MATTER WHETHER ITS A HOLIDAY OR NOT. Our family stayed here the week leading up to and including Christmas, and it was one of the loveliest holidays we've had. The pictures don't fully do the house justice. They can't quite capture the intense green of the vegetation or the incredible views all around. We watched the sun rise from one side of the porch each morning, listening to the deep rumble of howler monkeys nearby and watching flocks of birds pass at eye level; and we could catch the sunset each evening from the main section of the porch. The pool is lovely and warm. The house is very comfortable, very well-maintained and well designed for privacy. It comes with ample security--both a small safe in a bedroom and an extensive alarm system. We did have Internet access by simply using a passcode, despite what other reviewers have said. We had breakfast and cooked dinner each day, and found everything we needed in the kitchen. We were also grateful to have a washer and dryer in the basement. The gardener, Danielo, is an artist--the gardens around the house are truly exquisite, and he came each day to tend to the plants and to the pool. He and the housekeeper were both lovely people. The one thing I would warn visitors of ahead of time: The house is up a very, very steep, rutted dirt road. We were grateful to have rented an SUV. 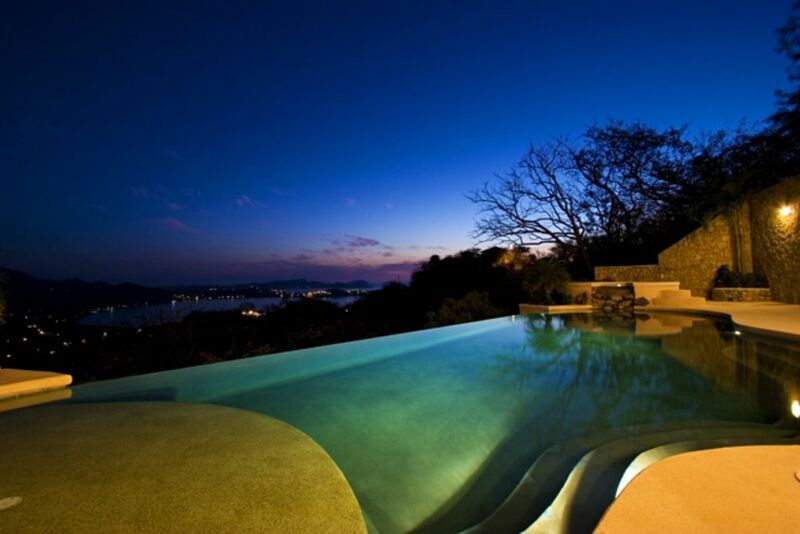 Beautiful infinity pool and the view from both the upper and pool level was awesome! Loved the monkeys that visited the tree right by the balcony. The bedrooms in the lower level were smaller than anticipated and the bed was VERY uncomfortable in the pool side bedroom. It was advertised as a queen bed but didn't feel like one. Overall the property had beautiful foliage and was clean and well maintained, however, there were 100s of tiny ants crawling around the jacuzzi in the master bedroom and also some in the kitchen. And large ants crawling up the outside of the house. Housekeeping sprayed around the jacuzzi and left the dead ants there until 2 days later (their next cleaning day). It would have been better customer service if they had returned earlier or checked the jacuzzi area before the end of the day of treatment. There also is no fan in the pool level bathroom so it makes the adjoining bedroom muggy and hot. The ad said that Casa Thu had 3 bedrooms each with their own private bathroom. The master bedroom was the only bedroom with a private bathroom. Bedrooms 2 & 3 shared a bathroom. Another downside was the lack of internet, which we knew ahead of time. However, with the high price during a low season time, having internet would have been a perk. The view and pool certainly were impressive but we will not stay there again due to the ants and bedroom setup. We appreciate you taking the time to leave a review. This house does have fabulous views. As always we make every effort to have the property ready for our clients to enjoy. I have spoken with the housekeeping about the ants. Being in Costa Rica we cannot prevent them from coming, but will certainly make every effort to deal with them better so the next clients do not encounter the same issue. I realize that the homeaway listing describes the property correctly but another web site did have the information incorrect. That has now be corrected and thank you for bringing that to our attention. I will also pass on the information about the fan and bed to the owners. We do provide an internet USB stick to all of the guests that stay at this home so they can have access with their laptops. December through April is our high season when everyone wants to get out of the cold weather and visit. The weather is great in this area of Costa Rica because we have no rain and therefore the rates are higher during this busy period. We hope that you will return to visit again in the future. My wife and I stayed here for our Honeymoon in early February. The house was beautiful and everything you see in the pics plus more. The views when you walk in the front door were amazing. The Master bedroom was very nice, there is a large soaker tub and huge stand up shower. The 2 downstairs bedrooms were not huge and they do share a bathroom. Not a big deal since you're in Costa Rica and the last thing you want to do is sleep. A few friends came later in our trip and had no complaints about them. The Gardener and House Keeper were amazing. The house was cleaned almost every day and she even cleaned our clothes daily, we never even saw her there. We did have an experience with some ants envading the dining area. When reported to the gardener they were promptly killed and removed. This type of thing is to be expected in remote newer homes which didn't bother us. Overall I could not have hoped for a better experience in Costa Rica. I wish I was still there right now. Perfect place for a Honeymoon or a vacation with privacy. Nothing ubstructing your view and nobody around except one neighbor on the right which were great people to meet. THE OTHER REVIEW OF THIS HOME IS SHOCKING TO ME AND MY WIFE. I would recommend this home to anyone and plan on coming back ASAP. Our family of four (kids aged 7 and 10) stayed at Casa Thu last November during the Thanksgiving week. We were in AWE from the second we stepped in the front door and saw the view. Actually, we all started to get a little giddy when we were escorted to the front gate and saw how gorgeous the landscaping was and how private the home felt. What's not mentioned much, but should be, is just how safe and secure this house is. The home is very "tucked away" and is safely secure behind a wrought iron gate. Then additionally, there is the home security system to enhance the security features. The master bedroom is huge with a comfortable King bed. As mentioned, the two other bedrooms aren't huge, but they accommodate a queen size bed and there is plenty of space to walk around. The view out of one of the bedrooms is outstanding!! We loved this house! We only had two "issues" with the house and one was no wifi. I know there is a USB stick available, but that's only if you have a laptop (which we did), but we (and the property management company) had tremendous problems getting it to work. That was unfortunate. Also, we had hoped that the Jacuzzi would be heated, but it wasn't. Other than that, the home was Perfect for us! We enjoyed many of the activities that we booked through the PM company and they were wonderful to work with. I would book this home with confidence! Casa Thu is located in Potrero close to Playa Penca, Playa Prieta and Sugar Beach. Potrero is a quiet community but close to Flamingo Beach and surrounding activities. The area is known for its world class sport fishing and other tourist activities. Potrero is in the northwest area of Costa Rica and located between Tamarindo and the Papagayo Penninsula.